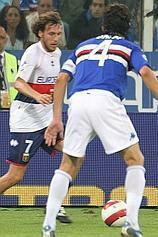 Especially in the season of Serse Cosmi Genoa often lost points in the last minutes of the game. One of the main reasons in the past was the fever to loose points, so many times the team played the dying minutes of the game in a defensive way. Now with Mr. Gasperini Genoa always tries to play offensive and like the best Dutch player of all times Johan Cruijff always says: to attack is the best defense. As long as you have the ball, the opponent can’t score. Today to be honest Genoa also was lucky. In the twelveth minute Leon gave a good cross and before Borriello could shoot, Cannavaro already shoot the bal in his own goal: 0-1. In the second half Napoli got their almost usual penalty in homematches. Domizzi scored the penalty behind Alessio Scarpi. After the equalizer it was mostly Napoli that was close to the winning goal, but if possible Genoa also tried to win the match. In the 89th minute Borriello gave a perfect cross just on the head of substitute Giuseppe Sculli: 1-2. Now Genoa is on the 9th position in the standings, which is fantastic, but not the most important fact of this weekend. Most specially was the warm welcome and the applause by Napoli-fans the Genoa-team got at the arrival at the airport and by entering their hotel and the stadium. 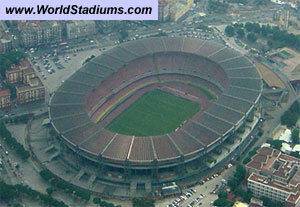 Genoa and Napoli: friends forever !! Clip of the first victory against Udinese! Ah! Webmaster DJ Pure de Mele was the last days only looking at the widget right with the standings. So he forgot to post the You Tube-clip. But here it is: our first victory this season. It’s feels good, right above the ciclisti. For the second time in a row the Italian Football Association tries to destroy the friendship of Napoli and Genoa-fans. Last year the topmatch in Serie B was moved to a monday-evening so not many Genoani could visit the match and this year it is even more worse. Because of the problems during Napoli-Livorno last wednesday there are no supporters allowed to enter the stadium next Sunday. Already 2000 Genoa-fans booked their 700 kilometers trip to Naples this weekend to have again a party with our twin-supporters. All the newspaper were full of the incredible atmosphere during the promotionmatch Genoa-Napoli last June when Genoa-supporters congratulated Napoli-players inside the field, but the Italian Football authorities still don’t like the two teams that were already punished so many times in the past. It’s a shame ! Tonight Genoa booked the first victory in Serie A: 3-2 against Udinese in a very, very attractive match. 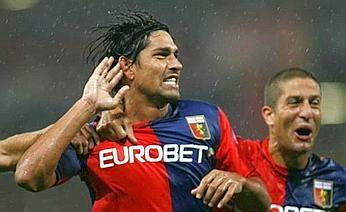 Genoa-striker Marco Borriello scored all 3 red and blue goals. In the 20th minute Marco scored his first one. Directly after halftime Borriello scored his second goal with his head, but the happiness lasted only a few minutes because Rubinho got a false red card. Our goalkeeper touched the ball with his hands inside the penalty-area and not outside like referee Ciampi decided. To make it even more worse Asamoah scored the 2-1 only 2 minutes later. With 10 against 11 of course Genoa lost control of the match and substitute goalkeeper Scarpi had to make many saves. In the 73rd minute Borriello was softly touched by defender Zapata inside the penalty-area but to correct his error with Rubinho now referee Ciampi gave Genoa a penalty that Borriello scored. Only 4 minutes later Mesto made it 3-2 with a shot that was half blocked by Gaetano de Rosa. The last sixteen minutes lasted hours, but after the final whistle of the referee the party started. Genoa is now together with European champion A.C. Milan on the shared 9th position in the tables, just outside the Uefa-cup zone. Again, we found the best You Tube match-clip around. No goals but a good impression of the game. Enjoy! The first derby in Serie A after 12 years ended without goals: 0-0. Genoa did not play in their 3-4-3 system like usual, but with only 2 strikers (Borriello and Di Vaio), 5 midfieldplayers (Rossi, Konko, Milanetto, Coppola and Fabiano) and the usual 3 defenders (Bega, Bovo and Lucarelli). Sampdoria did not gave Omar Milanetto any chance to play his usual role as playmaker of Genoa, so other Genoa-players had to organize the offensive part of the match, which did not succeed very well. Best Genoa-player: Marco Rossi, while it also need to be said that Sampdoria-players acted very agressive and frustrated like Bellucci that kicked Rubinho in the face while our goalkeeper already had the ball in his hands. In Skysportscafé around 20 Genoani (no ciclisti !!) watched the match together on 2 big screens, while Real Madrid fans had to watch their match against Valladolid on 1 very little screen. Amsterdam solo Rossoblu ! The last derby in Serie A was played on 30th April 1995. After 53 minutes David Platt scored the first goal: 0-1. Exactly 15 minutes later our Johnny van ‘t Schip produced the equalizer: 1-1. In the 76th minute Tomas Skuhravy scored the winning Genoa-goal: 2-1. Let’s hope tonight we have the same result: a 2-1 victory! Genoa-fans on strike: no choreography ?! After the dead of a policeman during the match Catania-Palermo the Italian government made a lot of new rules for football-supporters. Some of them are reasonable, but a lot are like often in politics: not realistic. 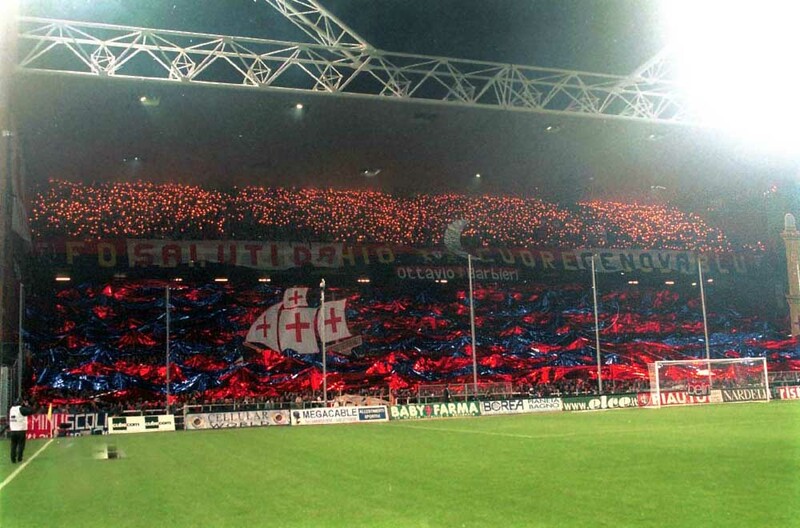 To protest against the new rules their is a big chance that Genoa-fans do not want to make a choreography tomorrow. 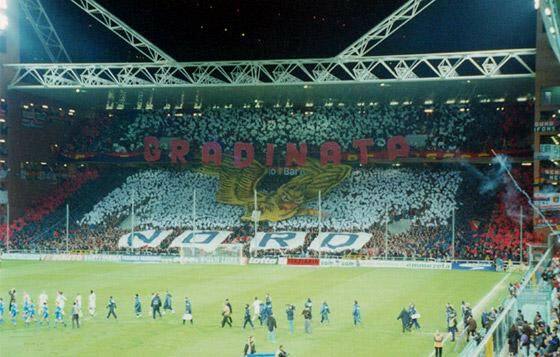 A reasonable, but very pitty decision because Gradinata Nord is a frequently winner of the contest of best Italian choreography of the season, also in the years Genoa played in Serie B. Let’s hope in february during the home-derby there is again a fantastic red and blue choreography! This afternoon more than 2000 Genoa-fans came to Gianluca Signorini trainingfield to support the team during the preparation for the derby. Genoa played their usual thursday-afternoon friendly match, this time against their own Primavera-team. The Gasperini-boys did win by 8-1 (4 goals of Di Vaio, 2 of Papa Waigo and a goal of Leon + Bovo). Defenders Dos Santos and Masiello are back in the team, while De Rosa and Lucarelli still are injured and probably not on time to play the derby, in which Genoa surely misses banned Juric. For people abroad and the die-hard fans: the match from sunday found on You Tube.